Actor Vishal, himself an icon, joined the fan club of Thums Up supporters as Coca-Cola India, today announced Vishal as the brand ambassador of Thums Up in Tamil Nadu. Thums Up is India’s largest selling cola drink and an icon of more than 35 years. 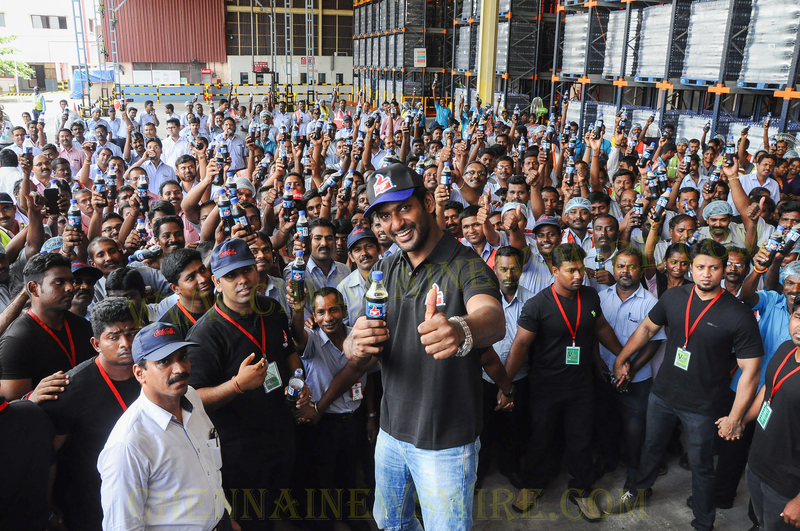 Actor Vishal travelled all the way to the Hindustan Coca-Cola bottling Plant at Nemam, to pick up one of the first bottle’s of Thums Up, to mark his association with the brand. T. Krishnakumar, CEO, Hindustan Coca-Cola Beverages Pvt. Ltd welcomed Vishal to the Coca-Cola family, as he handed over a Company T-shirt and cap to the film sensation and also presented him a bottle of his favourite soft drink – Thums Up. He took a tour of the entire Plant facility including the bottling line, the filling and crowing stations, the raw water treatment plant, the seven stage water filtration process, the re-use and recycle practices for waste water, the effluent treatment plant and the solid waste disposal process. Visibly elated and informed of the robust quality and environmental practices at the Plant and impressed with the state-of-the-art equipment at the facility, he also met the Hindustan Coca-Cola employees at the factory, shook hands, signed autographs and spoke to them. Vishal now joins, Mahesh Babu and Salman Khan as the brand ambassadors of Thums Up in the country. Thums Up is among the top two selling soft drinks in the country along with Sprite (also a product of The Coca-Cola Company) and both of them have more than 15% share of the soft drinks market. Launched in 1997, Thums Up has been the country’s most iconic and resilient brand. Thums Up is known for its strong, fizzy taste and its confident, mature and uniquely masculine attitude. Earlier positioned as a “refreshing cola” with iconic campaigns like “Happy Days are here again”, in 1993, Thums Up was re-positioned as a masculine drink given its strong taste – A positioning, it has maintained ever since. According to independent estimates, the Non-Alcoholic Ready To Drink (NARTD) beverage market in the southern states of Tamil Nadu, Karnataka, Kerala and Andhra Pradesh – is estimated at Rs. 7,000/- crore with Sparkling beverages being more than 60% of this market. 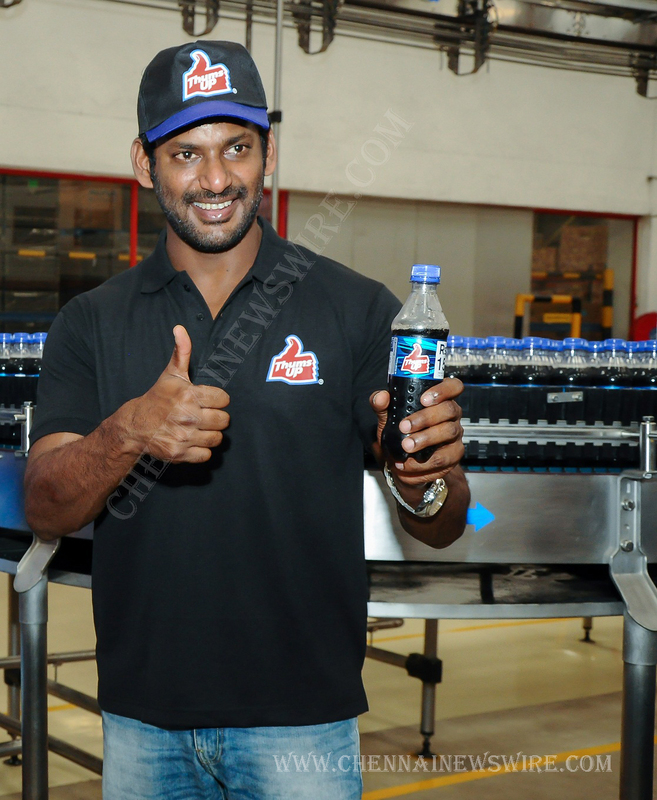 According to Debabrata Mukherjee, “We are extremely pleased to have Vishal as the face of Thums Up in Tamil Nadu. His appeal cuts across age groups and socio economic strata, just like Thums Up and his personality reflects the brand’s core values of masculinity, adventure and thrill. We are excited by the prospects that lie ahead for the brand and our partnership with Vishal”. He further added, “Through the latest campaign, Thums Up is aiming to make a cultural shift of acceptance that the hero is not divine anymore, but that it is there in all of us, it’s just a matter of finding it within oneself, hence the clarion call “AAJ KUCH TOOFANI KARTEY HAIN”. The brand will kick start this association with the Tamil star through a spectacular new campaign featuring Vishal. Going on air in a few days, the campaign is an extension of the brand philosophy ‘Aaj Kuch Toofani Kartey Hain’, which urges its consumers to push the boundaries, to pave their own path and to believe that heroism is a choice that one makes in life. The high adrenaline campaign shows Vishal adding his unique style quotient as he takes a ‘toofani’ route to get his Thums Up, turning a mundane situation of a store running out of his favourite Thums Up, into an exciting tale of adrenaline pumping action. Vishal as the leader of his group inspires the youth by urging them to challenge the status quo and take the leap of faith to undertake a series of ‘toofani’ acts to get his Thums Up. Actor Vishal said, “I look forward to this partnership with Thums Up, a soft drink that I have grown up with.Thums Up to me has always been synonymous with the spirit of resilience, passion and inspiration. These are attributes that resonate with me, and I completely believe in the campaign’s core philosophy that the ‘Toofan’ is indeed within all of us”. The new campaign for Thums Up in Tamil Nadu has been conceptualized by Leo Burnett, the TVC has been created by Sainath Saraban, National Creative Director Leo Burnett. The TVC has been directed by Kapil Sharma under the RU Films production banner and the thumping music has been composed by Ram Sampath (of Omgrown Music). The campaign will be amplified through a 360 degree integrated communication plan. Commenting on the film, Sainath Saraban, National Creative Director, Leo Burnett said, “Thums Up campaigns are about adventure, dare-devil attitude and the ability to push beyond one’s limits. The new campaign embodies these values, and having someone like Vishal whose sheer screen presence is so dynamic and Toofani, really added to the experience. We had a great time shooting with Vishal. The end result is something we are all proud of and we hope the viewers’ enjoy the campaign as much as we did”. Hindustan Coca-Cola Beverages Pvt. Ltd, is the largest bottling partner of The Coca-Cola Company in India. It is part of the The Coca-Cola Company’s Bottling Investment Group (BIG) and responsible for the manufacture, package, sale and distribution of beverages under the trademarks of The Coca-Cola Company. The Company has always placed high value on good citizenship. For further information on the Company’s India operations and its products, please visit www.hindustancoca-cola.com. Coca-Cola India, is one of the country’s leading beverage companies, offering a range of healthy, safe, high quality, refreshing beverage options to consumers. Over the last 21 years, ever since its re-entry in 1993, the company has gone on to establish an unmatched portfolio of beverages; refreshing consumers with its leading beverage brands like Coca-Cola, Coca-Cola Zero, Diet Coke, Thums Up, Fanta, Limca, Sprite, Maaza, Minute Maid range of juices, Georgia and Georgia gold range of hot and cold tea and coffee options, Kinley and Bonaqua packaged drinking water, Kinley Club Soda and BURN. The Company along with its bottling partners, through a strong network of over 2.6 million retail outlets, touches the lives of millions of consumers. Its brands are some of the most preferred and most sold beverages in the country – Thums Up and Sprite – being the top selling sparkling beverages.